The work of surrealist painter Salvador Dali has long enchanted and puzzled those who have seen it. Now both fans and newcomers to the legendary artist can praise him in the best way possible: by sharing his work. 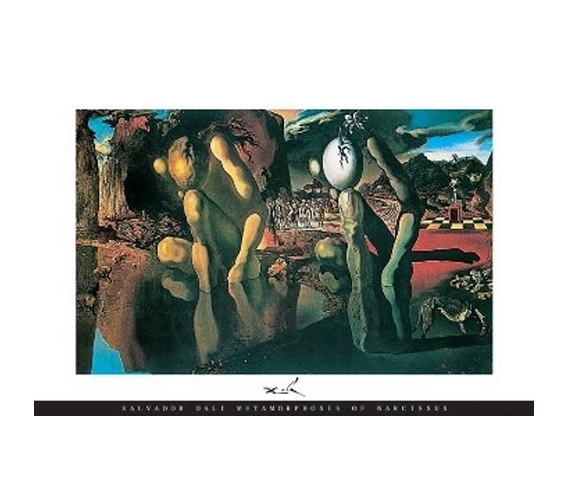 Hang this 24 x 36 poster copy of Dali's famous Metamorphosis of Narcissus on your dorm wall, and you'll not only make a statement about yourself; you might recruit some new admirers of Dali as well! You don't have to be an art major to appreciate good art, and Dali's Metamorphosis is a great place to start. Dorm Tip: Not a fan of Dali or even this particular painting, you say? Well are you looking for a way to break the ice with that cute but enigmatic artsy girl down the hall? I think you know what we're getting at here.